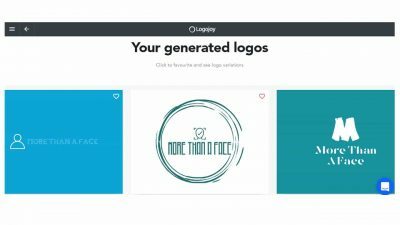 Is this the logo design programme for you? At the time of writing this blog I am in the process of setting up a charity called More Than a Face. Inspired by my son Harry who was born with a rare cranio-facial condition called Goldenhar syndrome, I aim to raise awareness of facial disfigurement by offering workshops in high schools. Setting the charity up is proving to be quite the challenge and on top of the logistics and legalities of it all I have spent a lot of time thinking about the logo of the charity. You’ve only got to look at companies like McDonalds, Apple and Nike to know that the right branding is crucial. The colour, font and images need to be clear and convey the mission and ethos behind the logo so people have an understanding of your aims. Quite the challenge so when I was offered a logo creation package to trial I was keen to see what I could come up with. 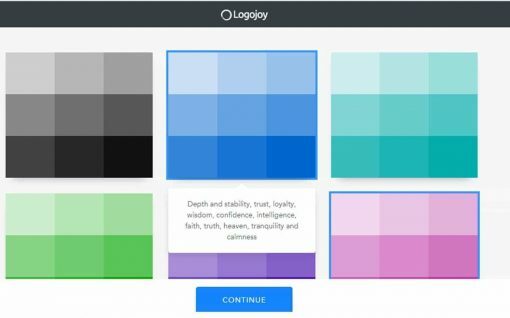 Logojoy.com holds your hand through a series of steps to design a logo that not only reflects who you are as a designer but engages your viewers. Designs are sharp and simple and the process is equally straightforward. 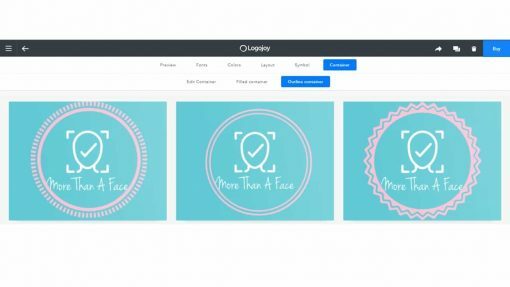 Step 1 – The website uses artificial intelligence to get a ‘feel’ for what it is that you like in a design. I was asked to choose 5 designs that I liked the look of so that the programme could use the common elements and help me design my own. Step 2 – Colour grids were shown and I was asked to select the colours that I liked. I chose a blue and deep pink which are my branding colours on my blog website (but even this got me wondering whether the charity should be linked to Our Altered Life or have a totally separate identity of its own). There’s a brief explanation of the psychology behind the colour choices although I’m not sure that my other half would agree that the purples are ‘girly’. In today’s climate I think it’s a controversial label. Step 3 – I was asked to input the name of the company and the slogan (optional). I don’t have a slogan at the moment and again I found myself wondering whether I should have one and what I would want it to be. Who knew that designing a logo would hurt my head so much? Step 4 – I was given access to a library of different logos to search within. 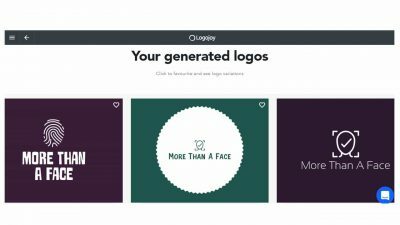 I chose ‘face’ and wasn’t blown away by the choices but this could be because I already had the seed of an idea growing before I was offered the logo programme. I also selected ‘finger print’ as that’s part of my idea for the logo too. I have to say that the images themselves were very small and I think it would have helped to see them slightly bigger at the point of selection. I did find a couple that I quite liked and went with them. After this stage I was prompted to sign in with a social media account or create an account with my email address. No payment was asked of me but I couldn’t see the design ideas without logging in. No a big deal so I continued. Once I had signed in I was shown ten variations of font, colour and border of the logo. There was also an option to click ‘more’ where a further ten were generated a few more times. There was definitely lots of choice but they all only used one of the logos – either the face or the fingerprint. There wasn’t a design showing both or an option to overlap etc. I clicked on a design that I liked and I have to say that the ‘preview’ screen on this website is brilliant. It showed me what my design would look like on a business card, stationary, clothing, phone cover and building signs. To see what the flat 2D image would look like in real life was massively exciting (and not just because I get my kicks in stationary stores) and a great way of seeing if the image in real life lived up to the image in your head. From here, I was able to alter practically every aspect of the logo. There’s the option to change the font type, size, letter spacing etc. Every separate element of the design could have the colour changed and there were various layout options to play with. As I went through I was able to manipulate the size of the symbol and text separately which worked well but I would have liked a screen that showed me previous versions so that I could compare the current one with changes I had made before. There was also a few lines that I would have liked to erase from the design but that takes it to the bespoke designers which incurs another $100 charge. The option to alter the ‘container’ or border as I call it was fab and totally changed the look of the logo! At this point I was totally spoilt for choice and wished I had someone with me to give a second opinion. Maybe an option to share a few different versions of the designs with a couple of people would be helpful in the decision making process. Once I had settled on the correct container and made all the changes I wanted to I was promoted to pay for the design. There are three options to choose from and I was offered the premium package in exchange for my review. This allowed for future changes and re-downloads which I liked. The basic package doesn’t offer anywhere near enough and the one hour design time didn’t really feel worth the extra for the executive package so I can’t imagine anyone choosing anything other than this one. I downloaded my logo and was thrilled to see the different variations such as transparent background etc. All in all, the whole process took me about 20 minutes! Overall, I really enjoyed using the programme and the final logo really excited me! The fact that you are able to completely design the logo before you have to pay a penny makes me feel really comfortable in recommending the programme which is good value for money, time efficient and jam packed with inspiration! I was offered a payment and programme package in exchange for my honest review. All views are my own.